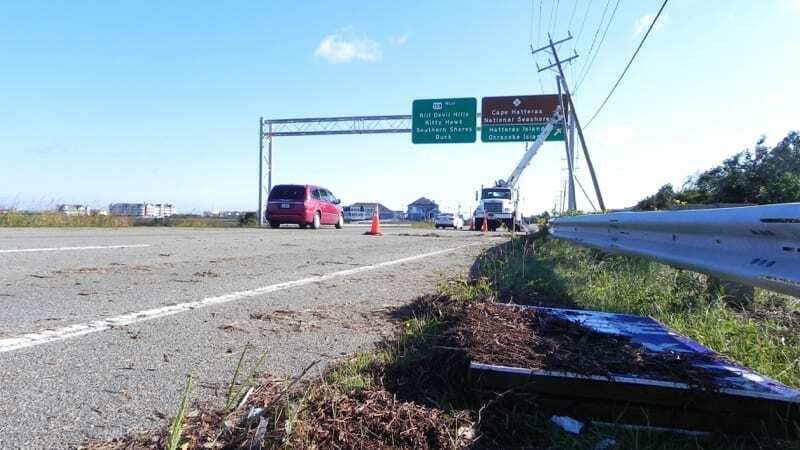 Nearly 2,000 remained without electricity Friday morning in Dare, Hyde and Currituck counties after the remnants of Hurricane Michael howled through the Outer Banks, bringing down trees and power lines and causing major soundside flooding from Hatteras to Currituck. 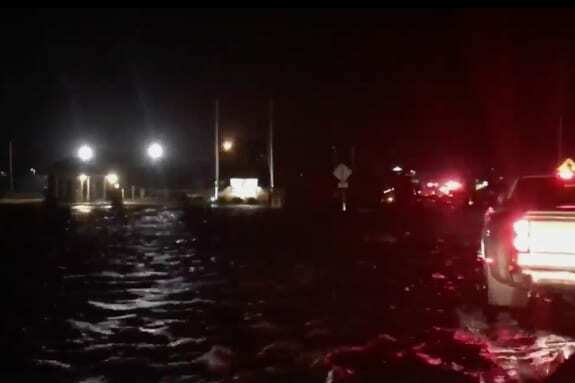 In Kill Devil Hills, a state of emergency was declared as officials assess and begin cleanup from flooding and outages overnight. 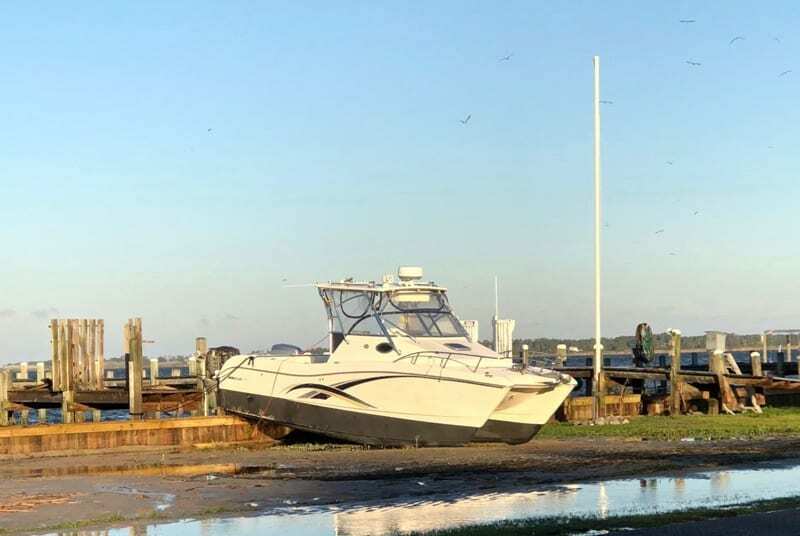 Colington was hit particularly hard, with flood waters reaching 4 feet before beginning to recede as Michael swept out into the Atlantic Ocean near the Virginia line. Town officials advised residents and visitors to stay inside this morning as they assess damage and begin cleaning up. ”There is debris along roadways, propane tanks floating in stormwater, and snakes that have come up with the sound,” the town said. 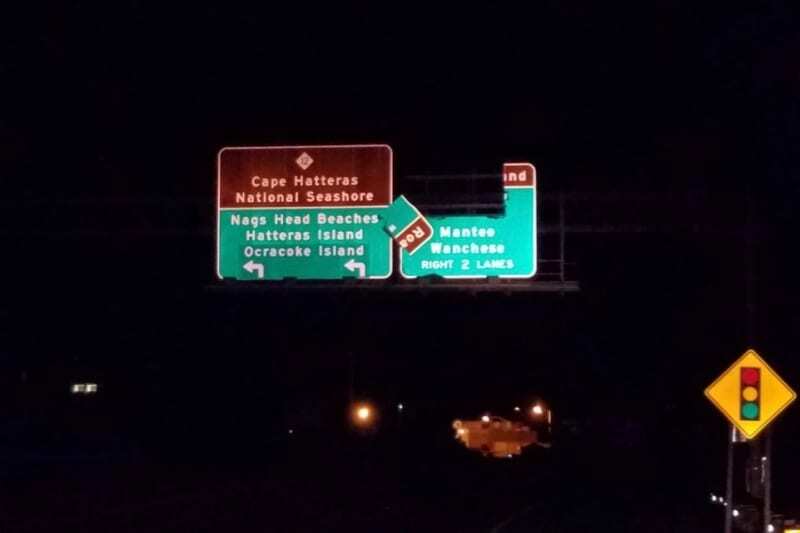 Just south, the U.S. 64 Manteo-Nags Head causeway reopened to travel in both directions this morning after being closed due to flooding and downed power lines overnight. 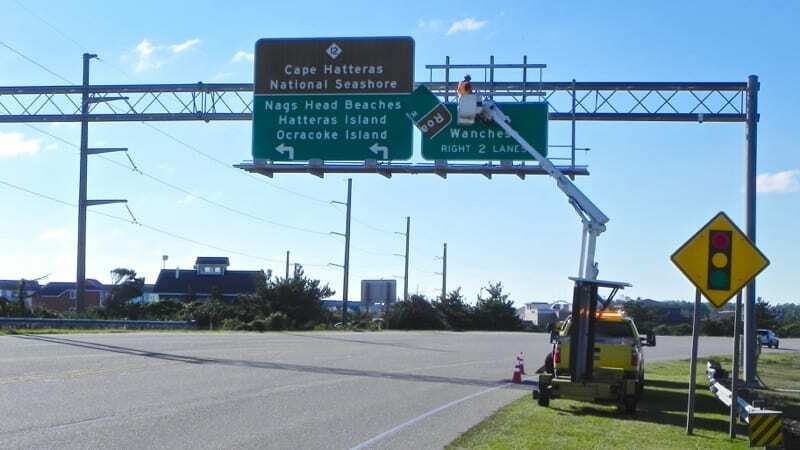 Nags Head officials asked travelers to use “extreme caution” due to debris on the road. 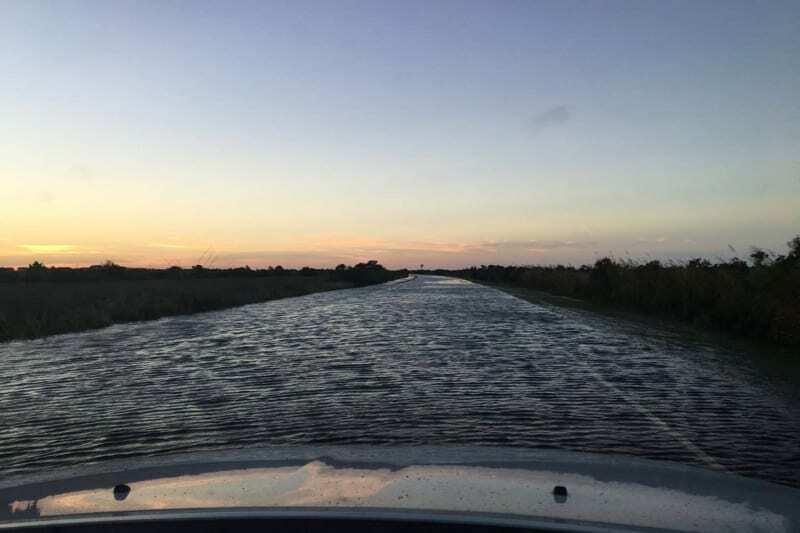 “Watch out for standing water and debris on streets vulnerable to soundside flooding,” town officials said in a news release. Nags Head offices opened on time today and there was no change to the sanitation schedule. Town officials planned to send out equipment today to clear debris at Soundside Road, Lakeside Drive, Danube Street and Pond Island. N.C. 12 through Duck was closed overnight, but reopened as of 7 a.m.
Town officials said debris and water remained, particularly near the Sanderling. Schools in Dare and Currituck counties were closed Friday. The Dare County Clerk of Courts office planned to open at 11 a.m., and District Court scheduled for today was also set to begin at 11 a.m. There will be no residential trash collection in Rodanthe, Waves, Salvo and Avon today due to water on roadways. Commercial pickup will occur as planned, contingent on water in the roadways. 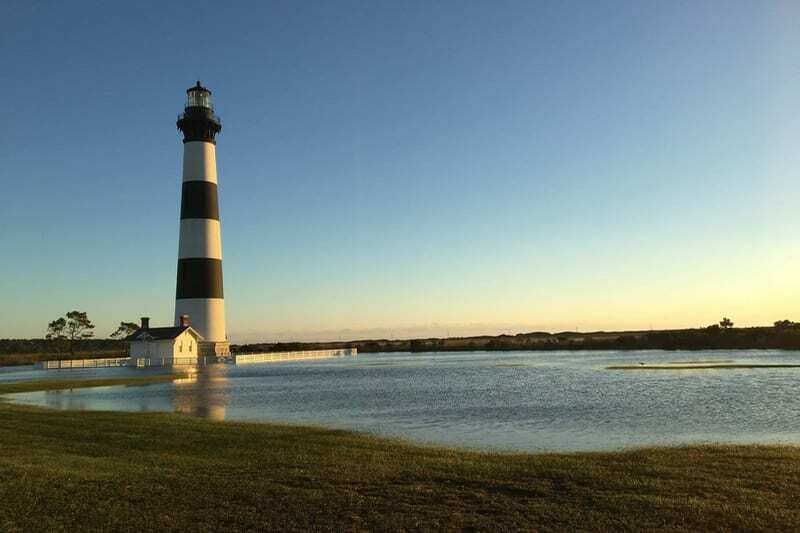 The National Park Service visitor facilities at Cape Hatteras National Seashore are opening at noon today, but officials noted some off-road beach routes may be impassable, particularly at high tide. The threat of rip currents remains high in the Atlantic Ocean and visitors are “strongly urged” to stay out of the water. NCDOT ferries all plan to run on regular schedules today. Sustained wind speeds overnight were more than 45 along the Outer Banks with gusts nearing 60 mph. The storm made landfall around midday Wednesday at Mexico Beach, Fla. as a strong category 4 system, with sustained winds of 155 mph. Michael had the third lowest barometric pressure, 919 millibars, for a storm making landfall in the United States in recorded history. We weren’t warned and it’s been great devastating. We prepared for Florence to the hilt! We lost two boats partially dock and backyard was demolished. We weren’t warned and hardly mentioned of it on media at all!!!!!!! It should be noted, the National Weather Service and National Hurricane Center predictions of 2 to 4 feet of soundside storm surge above ground for areas from Avon north was in our stories both here on the Voice and on radio repeatedly. TV did seem to be distracted by the events of Florida and elsewhere, but we tried our best to share the information as we could here. Florence. Evacuated. Nothing. Warnings on my cell phone every few minutes. Michael. Not one warning. No email, no beeping emergency message. Lost car and everything in garage. I am beyond upset. Yes. I’m with Over it. We should have received a warning or something. If you can block the road, you can warn people. Apparently, if you didn’t lose anything, you don’t care. I’ve moved my cars with every single storm prior to this one. Makes me sick. Are they doing road side debris pickup in Collington? How does a hurricane maintain its strength through 4 states over land 2 days after landfall in Florida? Just saying, it’s a first for me and I am in the business and have been riding out storms since 1984. Over it; really? If you are a local than you know when a storm is here,hurricane or nor’easters than there is the probability of sound side flooding. If you are not than you may want to reconsider visiting a sand bar and cya back to where you came from! 16 hours without power in Kitty Hawk. Over it, the fire department should not have to tell you there is a hurricane coming and that there are flood events associated with hurricanes. We all know what happens during these wind events and wind tides. Most of us know better than to be driving around in it..
Just give it a day or two and all will be fine. was more than the 2-4 ft forecast….not quite to the levels of Irene. (just over 6ft) There was a Surge Watch, but did it ever go to Warning status? Why doesn’t the fire departments have a warning system alarm when the sound is starting to come across Hwy. 12 so people can move their vehicles before they get flooded?